Conflicts at work often negatively affect enterprises and it takes managers much time and effort to deal with the conflicts. Being skilled at managing workplace conflicts not only improves relationships with employees or business partners, but also enhances the competitiveness of individuals and enterprises. The course is suitable for people who are accredited mediators or with basic knowledge of mediation. It covers workplace mediation concepts, principles and skills. Students will be better equipped with the knowledge by engaging in diversified learning activities such as group discussions, real-life case studies and role-plays. The course enables students to strengthen their mediation skills to resolve workplace conflicts as a workplace mediator. In addition, by improving relationships with co-workers and business partners, the efficiency and productivity at work will be greatly increased, which leads to a higher chance of promotion. Upon completion of the course, graduates will be qualified to apply to be a Certified Workplace Mediator. 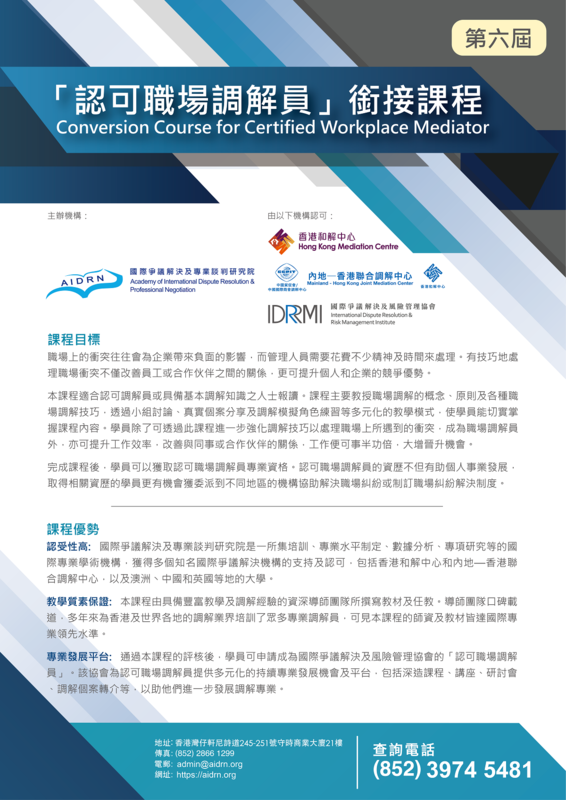 The qualification of Certified Workplace Mediator not only advances individuals’ career development, but also brings students opportunities to resolve workplace conflicts or develop policies for workplace conflict resolution in organizations across the world. AIDRN is a global academic institute that offers training, defines competency standards, and conducts researches and data analysis for dispute resolution and negotiation. AIDRN receives support and recognition from prominent dispute resolution organizations such as Hong Kong Mediation Centre, Mainland-Hong Kong Joint Mediation Center and universities in Australia, China and the United Kingdom. AIDRN provides diversified continuing professional development opportunities and platform to Certified Workplace Mediators, including advanced courses, talks, seminars, mediation, case referrals, etc., in order to help them further develop their mediation profession. Why does conflict happen in the Workplace? Students attaining 100% attendance in the course and passing the end-of-course assessment will be awarded a Certificate of Completion. Candidates successfully passing the assessment are eligible to apply to be the Certified Workplace Mediators of IDRRMI with the presence of the Certificate of Completion or the Assessment Results within a year. Application fee will be HK$500 (effective date will be till 31 December at the year of application) and annual fee will be HK$500. Application Method Please complete the application form (https://goo.gl/forms/mUgm7zXbbvltXIPm1) and submit the cheque or payment receipt to AIDRN by email, mail or in person on or before the deadline.